It has become global-policy commonsense that we need more people working in Science, Technology, Engineering and Mathematics (STEM) and that we must increase the proportion who are female, and that these goals are linked. 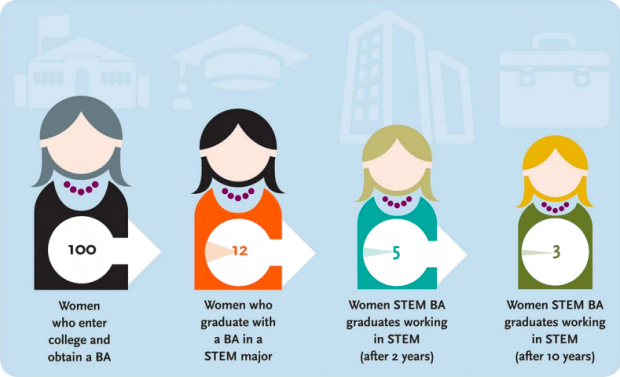 As a 2014 UK policy report on Women in Scientific Careers stated, a ‘compelling reason to tackle’ the gender gap ‘is that the UK economy needs more STEM workers and we cannot meet the demand without increasing the numbers of women in STEM’. The report does not ask which women are able to progress along ‘the pipeline’ from school science to post-16 STEM qualifications and careers. Typically, it makes only passing reference to ‘moral arguments’ for equality, focusing on the business case that increasing women’s STEM participation will boost the economy and create better working environments. In this blog we argue that pursuing economically-driven policies to increase the number of women in STEM without considering gender in intersection with race and class risks reproducing privilege. Kimberlé Crenshaw coined the term intersectionality in the 1980s to capture ‘the need to think and talk about race through a lens that looks at gender, or think and talk about feminism through a lens that looks at race’. It’s since been developed to incorporate relationships between disability, gender, race, sexuality and social class. 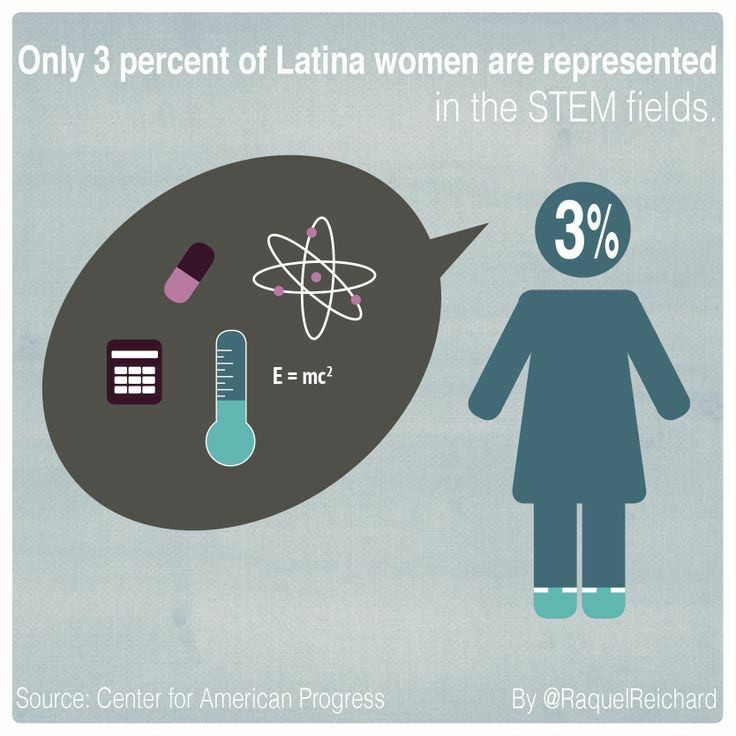 There is evidence of intersectionality’s importance for STEM recruitment, as statistical research shows that race, class and nation impact women’s relationships with STEM. 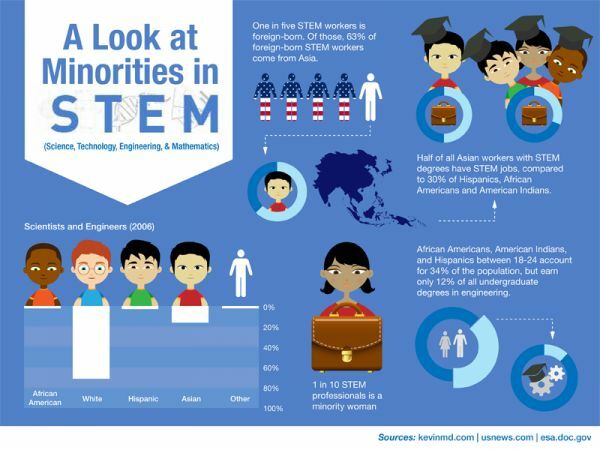 For example, studies show that US-born women studying science and engineering see STEM careers as less compatible with their values than international-born women on these courses and STEM stereotypes impact more on European-American than on African-American women. Indeed, minority ethnic and working-class women are more likely to drop out of computing courses for economic reasons than because of stereotypes of technology as masculine. This suggests that gender and STEM policies reflect the experiences of white middle-class women. Speaking on the ‘urgency of intersectionality’, Crenshaw argues that overall improvements for women do not ‘trickle down’ to marginalised women: ‘Without frames that allow us to see how social problems impact all the members of a targeted group, many will fall through the cracks of our movements’. It is difficult to change how we see the world, which experiences we notice and which are ignored. Doing so takes more than statistical data. It takes powerful stories. We offer one below to show intersectionality in action and that gender inequality does not trickle down. Gabriella is studying the high-status Natural Science Programme in upper-secondary school in Sweden, a country with an international reputation for gender equality but persistent gender gaps in STEM participation. Although academically unsuccessful, getting a mix of Cs, Ds and Es, she is planning to become a forester which includes taking a Masters in Biology. Given her lack of conventional success, how does Gabriella maintain an identification with science? Gabriella has unstyled short hair, wears tracksuit bottoms and sweaters, sometimes the same ones for a week, and uses no make-up. In refusing the demand that young women pay careful attention to their appearance, Gabriella strongly rejects femininity and so aligns with masculinity. We also see this alignment in her interests. She gives her hobbies as reading ‘fantasy mainly’ and playing computer games. Gabriella displays a knowledge of specialist genres of games (including retro and ‘indy games’) which marks her out as geeky. 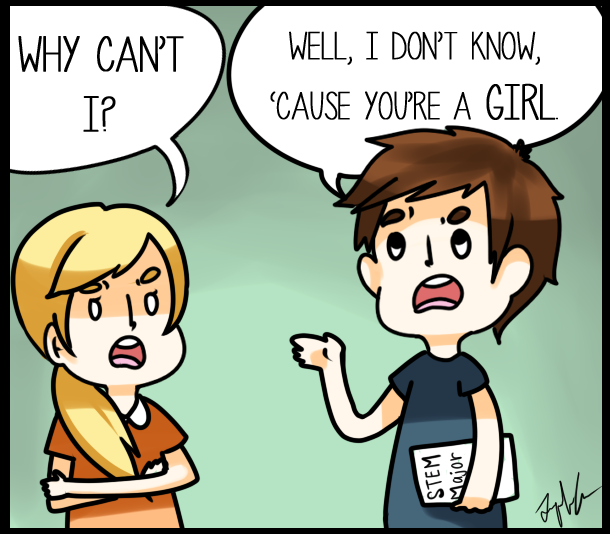 Although women are increasingly identifying as geeks, this identity remain associated with masculinity. Gabriella also breaks with dominant gender norms by distancing herself from from feminine-coded science professions. She favours forestry as it makes it less ‘likely that I’ll be stuck in a lab somewhere, as that’s what biologists usually end up doing’. She rejects the diligence and attention to detail that are typically attributed to women in science, dismissing STEM areas that are ‘so finicky and lots of sitting still’. Gabriella’s career choice is a way of realising her passion for the outdoors. As she explains: ‘in a lab, I would be far too bored and feel boxed in’. We can see this as another way of Gabriella aligning with masculinity since work indoors is socially coded as for women and work outdoors for men. However, it is also part of her Swedish identity. Exercising one’s rights to experience and appreciate nature is key to Swedish national identity. This is enunciated in ‘friluftsliv’, the Scandinavian back-to-nature movement with its roots in the eighteenth century. This identity is attached to whiteness. As Tobias Hübinette and Catrin Lundström argue, ‘being white constitutes the central core and the master signifier of Swedishness, and thus of being Swedish’. White men are shown more positively in relation to nature than women and immigrants with the latter portrayed as in need of training to relate appropriately to the natural world. Gabriella’s middle-class position also plays a role in her science aspirations. Research connects science choices to ‘science capital’, that is ‘scientific forms of cultural capital (scientific literacy; science dispositions, symbolic forms of knowledge about the transferability of science qualifications), … [and] of social capital (e.g., parental scientific knowledge; talking to others about science)’. Gabriella has strong science capital within her immediate and her extended family. Her sister and father work with technology, her cousin recently graduated from forestry and two family friends are foresters. Despite this, Gabriella presents forestry as an individual choice. To develop science policy that can support women in less privileged positions than Gabriella, we need to see her choice as social. Dominant policy frames stop at the fact of Gabriella’s gender, seeing her progression to a science university course as an economic (and moral) success. The deeper analysis of her identity above points to the significance of her non-normative gender performance and of social class, race and nation in her choice to pursue science. This suggests we need to ask which women can aspire to science careers and how other women (and men) are positioned in relation to science through their success. Gabriella’s rejection of conventional femininity supports her science identification and vice versa, but it reaffirms rather than challenges the dominant gendering of science as masculine. In forestry, Gabriella has found a STEM field where her participation is enabled by her intersecting gender expression, Swedishness, whiteness and middle-classness. But, where does that leave less-privileged women? And, how can we make gender and STEM policies that work with the messiness of intersectionality? As Crenshaw says, these are urgent questions. This article is written by Heather Mendick, Maria Berge and Anna Danielsson. It is based on their article ‘A critique of the STEM Pipeline: young people’s identities in Sweden and science education policy’, published in the British Journal of Educational Studies. It draws on the project ‘Power, Knowledge and Identity in Science and Technology Classrooms’ funded by the Swedish Research Council.